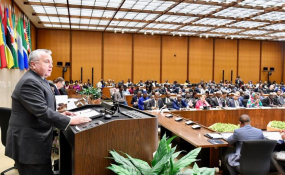 Deputy Secretary of State John Sullivan delivers opening remarks at the United States-Sub-Saharan Africa Trade and Economic Cooperation Forum (AGOA Forum) at the U.S. Department of State in Washington, D.C., on July 11, 2018. This year the U.S Department of State is proud to host the 17th annual African Growth and Opportunities Act Forum, commonly known as AGOA, from July 11-12 in Washington, DC. This year's theme "Forging New Strategies for U.S.-Africa Trade and Investment," reflects the U.S. commitment to boosting economic growth, spurring development, and reducing poverty in Africa through sustainable business practices and mutually beneficial trade relations. Enacted in 2002, AGOA brings together African and American government officials, civil society, and private sector representatives to discuss current trade and investment relations and possibilities for future engagement. At its core, AGOA seeks to expand U.S.-sub-Saharan African trade and investment, stimulate inclusive development and economic growth, foster a high-level dialogue on trade and investment-related issues, encourage economic integration, and facilitate sub-Saharan Africa's integration into the global economy. Specifically, AGOA provides generous trade preferences to sub-Saharan African countries that are making progress in implementing economic, legal, labor and human rights reforms. Today, AGOA not only receives broad bipartisan support in Congress, but also remains instrumental to our efforts to grow the next generation of emerging markets such as those of the countries of sub-Saharan Africa. In fact, the data has shown that the trade agreements established through AGOA have proven widely successful. Over the last year alone, total U.S. trade with Africa increased from $33 billion in 2016 to $38.5 billion, approximating an increase of $5 more for every person on the continent. Since the forum's inception non-oil trade under AGOA has increased more than 200 percent to $4.3 billion in 2017 from $1.4 billion in 2001. The growth of these non-oil industries has spurred an estimated 300,000 direct jobs in beneficiary countries. As we look to the future the United States remains steadfast with our African partners to further and expand the U.S.-Sub Saharan trade relationship. We believe that Africa represents the major emerging market of the future. Between now and 2050, roughly half of the world's population growth will occur in Africa as 1.2 billion new consumers will be added to the African market. Through AGOA, the U.S will continue to demonstrate its commitment to the expansion of trade and investment in the region to ensure its future success. Bianca Corgan works in the Bureau of African Affairs at the U.S. Department of State.